Hundreds of thousands of Iranians demonstrated Monday to mark the 40th anniversary of the country’s Islamic Revolution. Some of the protesters burned U.S. flags. Others carried pictures of Ayatollah Ruhollah Khomeini, the Shi’ite religious leader whose return from exile led to the ouster of Iran’s Shah. On February 11, 1979, Iran’s army declared its neutrality in the dispute between the two sides. Shah Mohammad Reza Pahlavi and his family were forced to flee the country. On Monday, Iranian state television broadcast images of people carrying Iranian flags and standing out in cold, rainy weather. Some demonstrators shouted “Death to Israel, Death to America” -- sayings often repeated at the time of the revolution. The Shah was the United States’ closest ally in the Middle East. Soldiers, students, clergymen and women wearing black filled streets across Iran. Many people carried pictures of Khomeini, who died in 1989, and Iran’s current Supreme Leader, Ayatollah Ali Khamenei. The large crowds at state-supported marches came as Iranians increasingly face economic hardship. Last year, the government suppressed protests over poor living conditions in over 80 cities and towns. The unrest was the most serious threat to Iran’s religious leaders since protests over disputed elections in 2009. Prices of food, especially meat, have risen a lot since U.S. President Donald Trump withdrew the United States from the 2015 nuclear agreement with Iran. Trump also reestablished U.S. economic sanctions against Iran. In January, President Hassan Rouhani said his country was experiencing its worst economic crisis since the overthrow of the Shah. He told Iranians that the Shah cared mostly about rich people and let the country’s secret police carry out abuses. 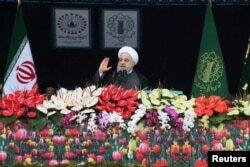 In a speech at Tehran’s Azadi (Freedom) square, Rouhani said U.S. efforts to separate Iran from other countries would fail. Another Iranian official warned that his country would destroy cities in Israel if the United States attacked Iran. Yadollah Javani is the Revolutionary Guards’ assistant head for political affairs. He said, “The United States does not have the courage to shoot a single bullet at us.” The state news agency IRNA reported his comments. Iranians walk past a missile during a rally marking the 40th anniversary of the 1979 Islamic Revolution, in Tehran, Iran, Monday, Feb. 11, 2019. At a parade to mark the anniversary, Iran showed off its weaponry, including a ground-to-ground missile that can travel a distance of 700 kilometers. 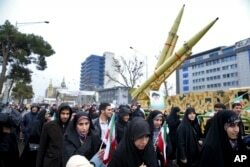 The Tasnim news agency reported that another missile can travel up to 800 kilometers. The Reuters News Agency reported this story. Susan Shand adapted the report for VOA Learning English. The editor was George Grow.